琉球新報社が、海外を拠点に持ち、沖縄の世界発信に貢献した者に与える「池宮城秀意賞」が、2014年に、ジョン・ダワー、ノーム・チョムスキーら103人の海外識者・文化人・運動家が辺野古新基地中止を訴えた声明行動に授与されることになりました。Okinawan newspaper Ryukyu Shimpo will grant its Ikemiyagushiku Shui Award to the January 2014 “Okinawa International Statement” that called for cancellation of the construction of the new U.S. Marine base in Henoko, signed by 103 scholars, artists and activists around the world, including John Dower and Noam Chomsky. 琉球新報の報道：Here is Ryukyu Shimpo’s announcement of the award on July 23. この贈呈式・記念シンポジウムが、９月１５日、琉球新報創立１２５周年の日に開かれます。上記声明の賛同者を代表して、米国からピーター・カズニック（アメリカン大学教授）、カナダからジョイ・コガワ（作家）と乗松聡子が来沖します。The award ceremony and symposium will be held on September 15, the 125th anniversary of the establishment of Ryukyu Shimpo, at its new headquarter building (1-10-3, Izumisaki, Naha-City, Okinawa). 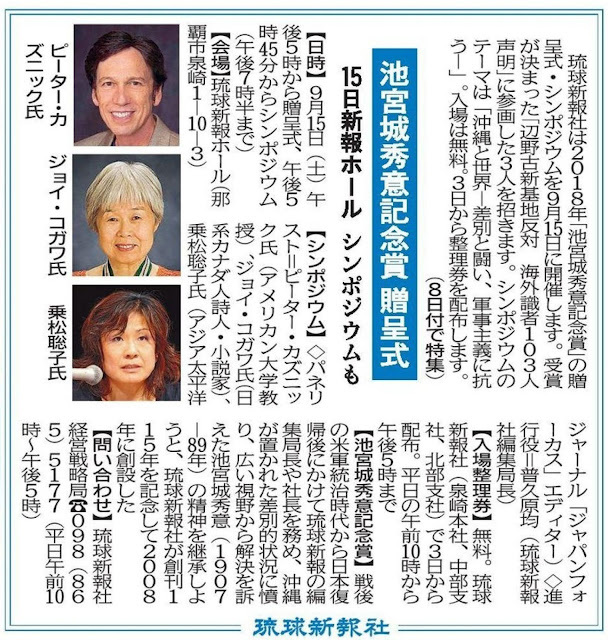 On behalf of all signers of the above statement, Peter Kuznick, Professor of American University, Joy Kogawa, a celebrated Canadian author, and Satoko Oka Norimatsu, Editor of the Asia-Pacific Journal: Japan Focus will attend the ceremony, and speak at the symposium.